Let’s go visit the cities of cheese. I’m very disorganized but I keep seeing things this way. I said, I am not close to objects and this is my way of talking to myself. We set sail for Port Salut, we will spend our summers in Gruyere. Nordost is a northern port. Tillamook is in this country, not a place we would visit. On March 15, Eric Paul and his wife Alifair traveled to New York City, the city of cheese, to visit some of the finest up-and-coming small cheese shops in Manhattan and Brooklyn. This is not the same kind of imaginative trip Ms. Johnson writes about in her fantastic 1985 book of poetry. We embarked on a visit to the city that houses dozens of old world traditional cheese shops throughout the city and surrounding boroughs. This trip followed on the heels of the prior weekend’s trip to the Berkshires and Central Mass to see Rubiner’s and Provisions, a new market in Northampton. 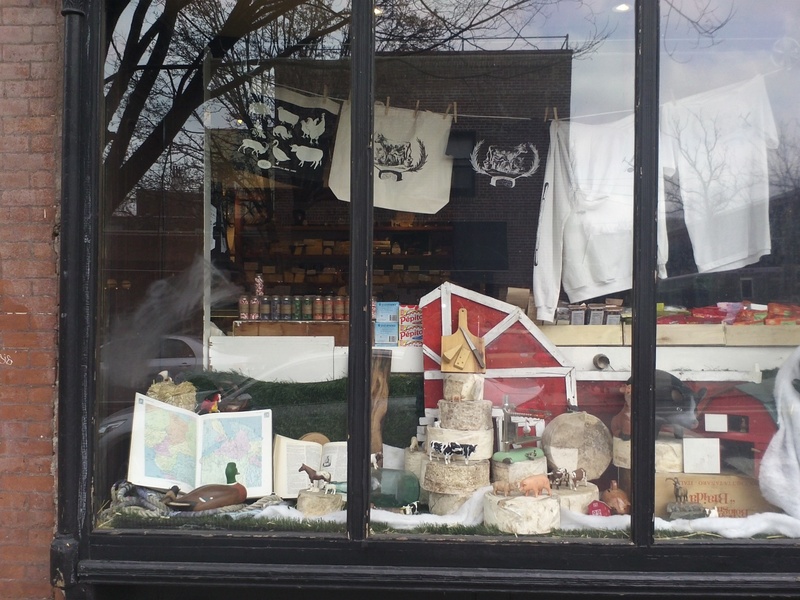 Since our travel to New York was a one-day trip, we limited our scope to those shops we felt most resembled The Cheese Traveler’s interest in small production, local and regional handcrafted cheeses, and size of retail space. We have had our eye out for just-the-right retail space for eighteen months and were settling on an eclectic neighborhood in downtown Albany close to the highway and other fine food establishments. Since our short stint at the Delmar Farmer’s Market last year, we wanted to stay committed to the “traveling” part of the business while also securing a space for the everyday customer and a prep area for events and composing gift packages within easy distance of Downtown Albany. 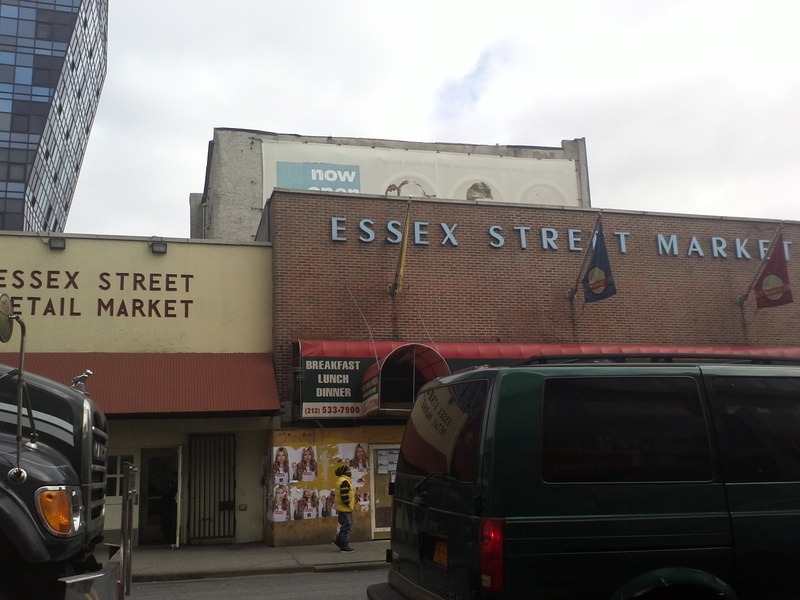 Our first stop was Saxelby Cheese Mongers in the Essex Street Market, New York’s premier, indoor “open air” market in the Lower East Side. Featuring purely regional Northeastern cheeses from small farms with herds of less than 40 animals, Saxelby’s is very similar to The Cheese Traveler in its commitment to selling regionally made, artisan cheeses. Moreover, Anne Saxelby was just named Manhattan’s Small Business of the Year. 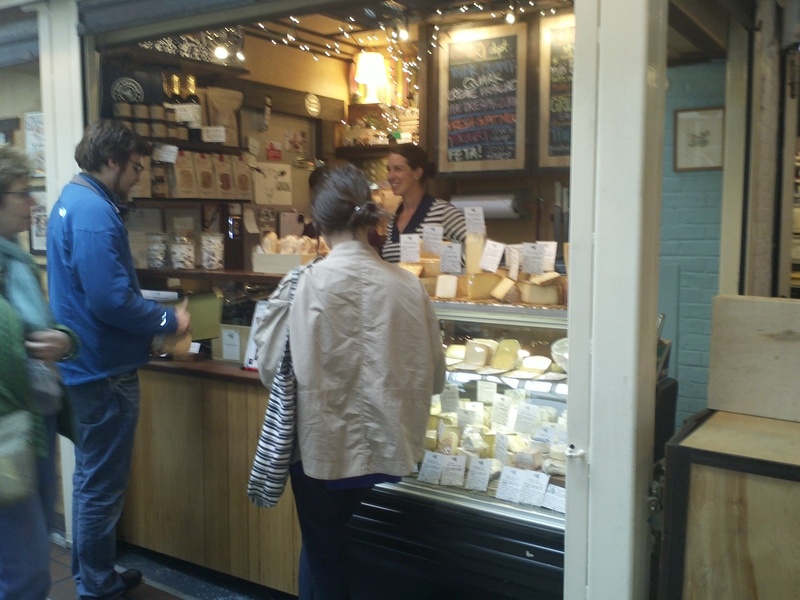 You heard that right: a cheese shop was named business of the year. 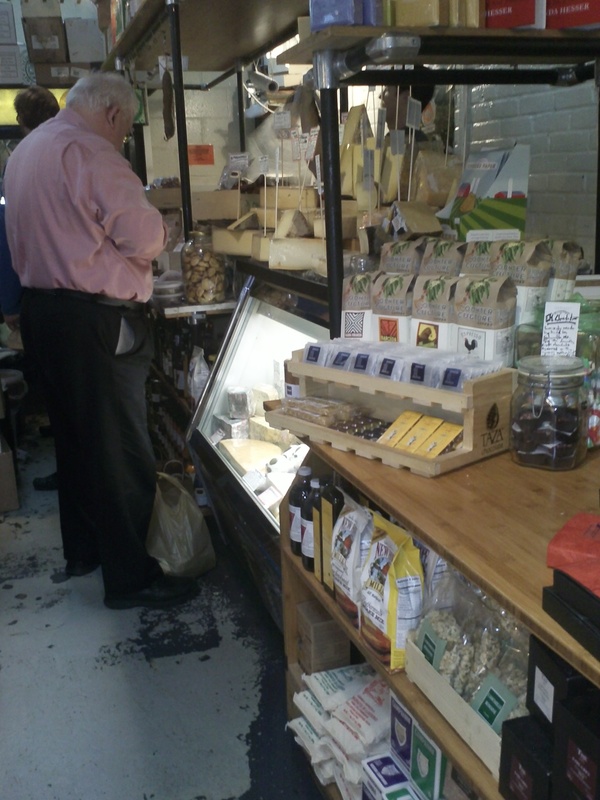 In The Big Apple, a cheesemonger is The Big Cheese. Entering the corner corridor off Delancey Street, we emerged into a light, sound, and smell-scape of ethnic foods and specialty shops, Saxelby’s being the first stall through the double glass doors. 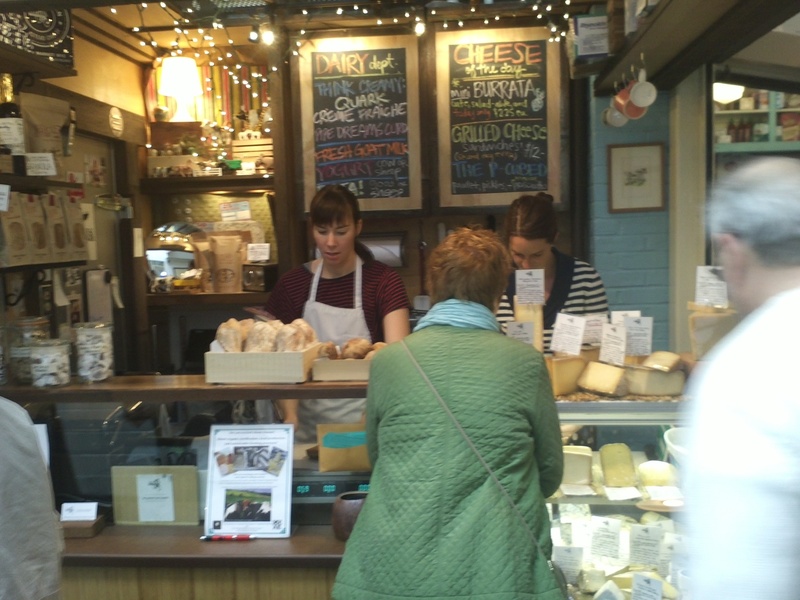 Anne Saxelby and a cheesemonger cutting cheese to order. As we discovered, a truly world-class, “American” cheese shop need not take up much space and there was even room to make prepared foods. We were very impressed by Saxelby’s custom-made walk-in cooler with an insulated window cut into the side. This window provided a extra display case in a compact design. So intelligent, so elegant. For cheeses, we picked up some old favorites: Shushan Snow and Brebis Blanc, two fresh sheep’s milk cheeses made at 3-Corner Field Farm in Shushan, NY. Next, we stopped at the other side of the market to visit Formaggio Essex, a branch location of Formaggio Kitchen in Cambridge, MA. 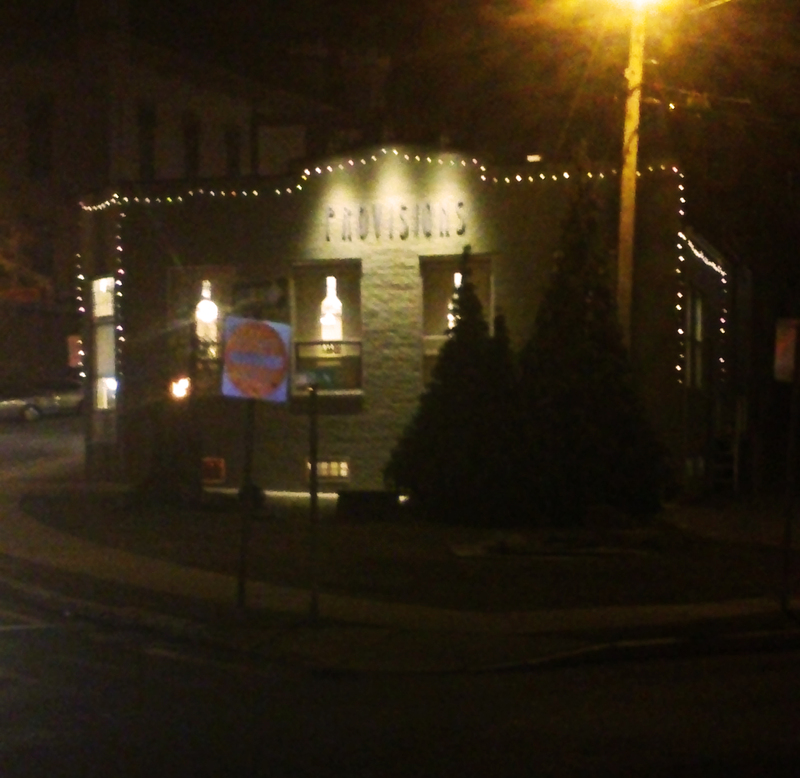 Formaggio Essex is a scaled-down version of its original, where Eric worked for a short time in 2010. Though small and packed, Formaggio Essex hosted a wide array of specialty foods including charcuterie, condiments, and sweet treats. We bought Vendéen Bichonné by affineur Pascal Beillevaire, a Loire valley cheese whose name means, “the pampered cheese from Vendée.” It is a creamy, sweet, nutty, semi-firm, natural rind cheese that coats the palate in a lovely way. All this cheese research was beginning to make us hungry, so Alifair stopped by the Brooklyn Taco Company to order a quick lunch. Little did I know that when I stepped into the black and white tiled taco stall, I was embarking on a unique taste journey rivaling the best neighborhood eats of the city. I ordered a Guaco Taco made with chunky avocado, raw sweet corn, tomatoes, red onion, cheese, crema, hot sauce and a yummy Black Bean Tamale. Once we were back at the car, Eric and I scarfed them down, not realizing just how hungry we had gotten. Then it was across the Williamsburg Bridge and into Brooklyn to visit the Bedford Cheese Shop. Mind you, this is the cheese shop where we found the difficult to procure Swiss sheep’s milk cheese for our 2011 “all-Swiss” themed Annual Wine and Cheese Tasting fundraiser at the First Unitarian Universalist Society of Albany. This was a wing-dinger of an event, considering that our choice of theme made things really hard on ourselves. First, Switzerland is a very small country, secondly, the country produces very few wines, and lastly, what they do produce, they export for a pretty penny. So trying to pair Swiss cheeses with Swiss wines was difficult to say the least. But we like challenge! Bedford provided us with the semi-hard sheep’s milk cheese Brebis de Rossinière, but that is a story for another time. We were excited to see the place that we admired for so long. 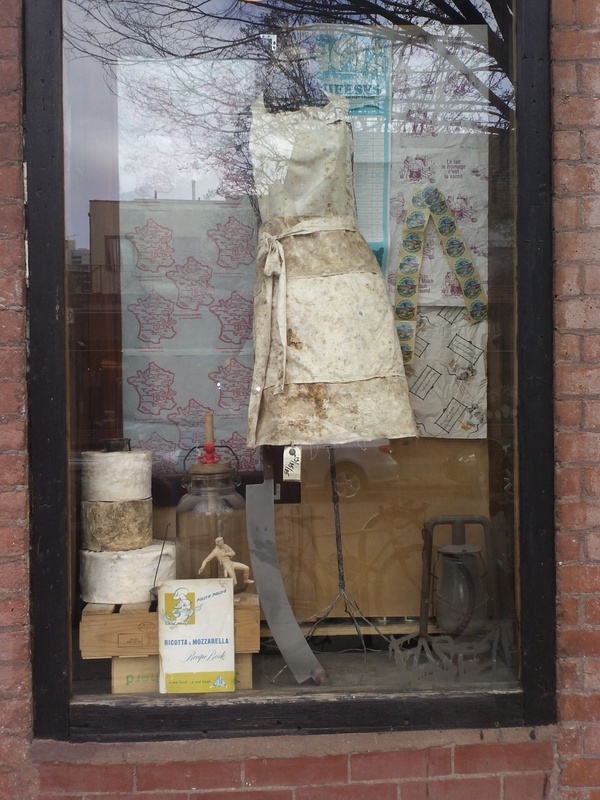 Oh my goodness, is that a dress apron made of cheese cloth? Why yes, I believe it is! The farm and foodie window dressings really drew us in. And let’s just say that the wide angle camera shots make the place look big, but only on the internet! The feel of the décor, royal red wallpaper, and dark custom shelves warmed the retail space and welcomed us in. Five cheesemongers busied themselves behind and in front of the counter making the whole place feel bustling and exciting. Bedford has no additional warehouse or cooler space beyond the retail floor, so all their cheeses are stocked in the abundant cases. We felt like cheese geeks in a cheesy store—that’s cheese-ease for “kids in a candy store.” But seriously, Bedford was no laughing matter, well, beyond the irreverent, over-sexed cheese descriptions enticing us to partake in tasting cheese as an illicit event. The fromagers were knowledgeable, unique, hip, and young—what else might anyone expect from Williamsburg? The stereotypical brown Oxford corduroy jackets with elbow patches tacking up their tatters crossed the street. In through the front door, little bell chiming, young “collegiates” professed their undying love for cheese over and over again. A dramatic place. High time to buy some dark chocolate-covered almonds, me thinks. What set Bedford Cheese aside from the other shops that we saw was a commitment to selling cheeses from esteemed French affineurs – Rodolphe Le Meunier, Jean d’Alos, and Hervè Mons to name a few. These are some of the most gorgeous cheeses that are usually only offered in the villages or the fine cheese shops of France. For our “research” we picked up a fancy little Lavort Goat, a spicy, raw goat’s milk version of a rare, Cheese Traveler’ favorite sheep’s milk cheese from Auvergne, and a luscious, creamy washed rind cheese that was tangy, slightly sweet, and nutty. 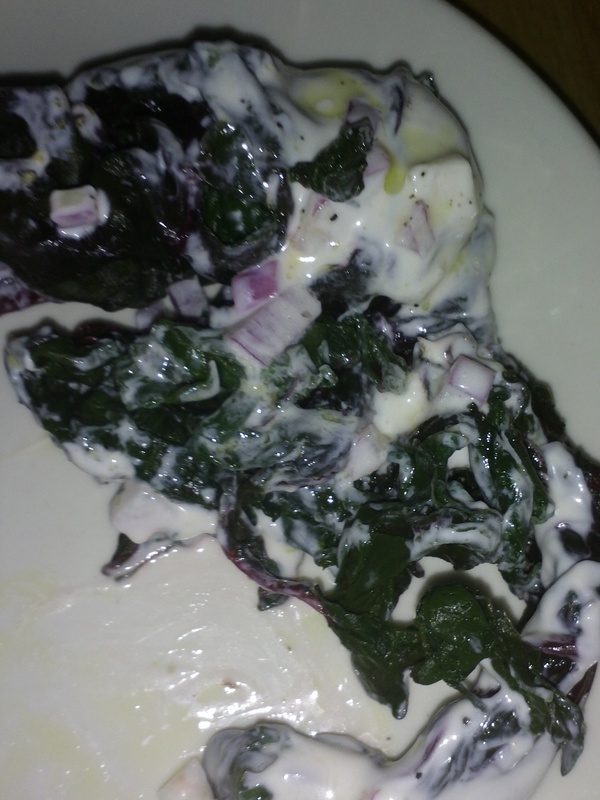 This was Alifair’s appetizer: to-die-for erbette chard with ricotta salata. Creamy goodness and greens cooked al dente. The onions were sweet little mouth bursts. 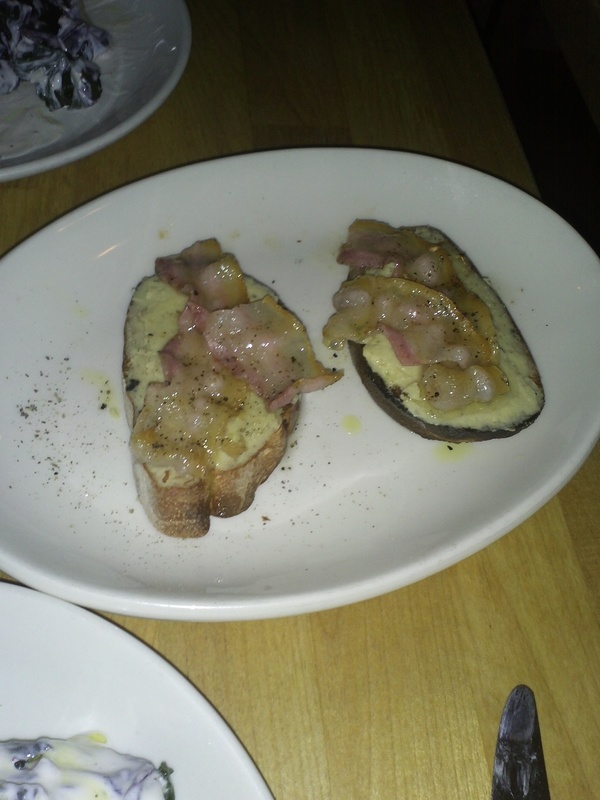 And that was Eric’s appetizer: crostini of wood-roasted pancetta with cicerchie beans. This dish was delicious, so wonderful in fact, that we wished we had more. That’s right, two crostini on the plate. Can’t we have just one more? Pretty please? After appetizers, we split a ricotta, buffalo mozzarella, garlic, oregano, and hot pepper pizza between the two of us and a few glasses of wine. Returning to Bklyn Larder, Alifair purchased a T-shirt—they are so cool—for Eric’s cheese T-shirt collection and hid it in a bag to surprise him later. Among the cheeses we bought Tomme Brebis et Chevre, a semi-soft mixed milk tome made of raw sheep and goat’s milk in the Pyrenees and aged by Savoie affineur Joseph Paccard; Dunbarton Blue, an award winning raw cow’s milk blue “cheddar” that is creamy like a cheddar with sparse blue veins, gentle blue spicing, and a good salt balance; a beautiful, lusciously creamy, ripened chevre log from Andante Dairy, with a delicate natural rind characteristic of French goat cheeses from the Loire region; and Green Hill, a soft ripened, camembert-style cheese from Sweet Grass Dairy whose bulging paste was buttery and mushroomy, with vegetal undertones. 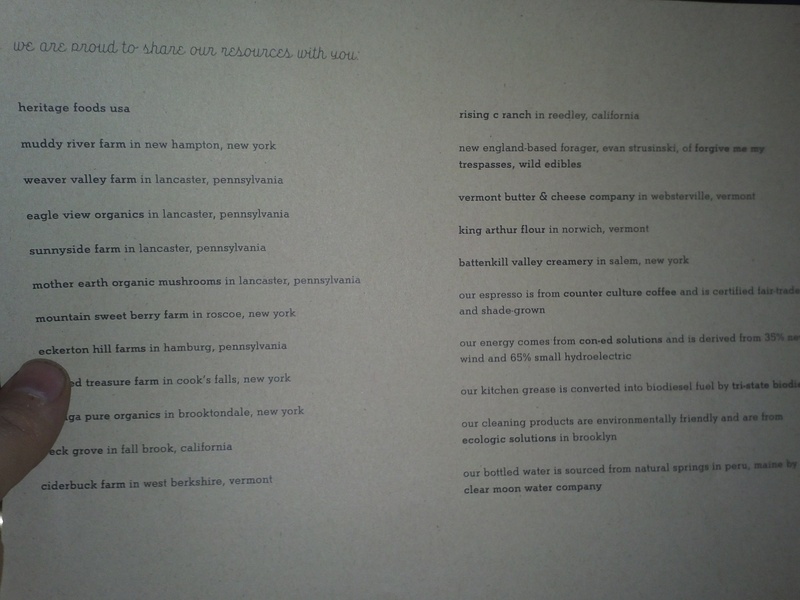 We also took home various charcuterie and two pints of coveted Bklyn Larder house-made gelato. Then we stopped at a nearby flower shop outside a quickie mart to buy an enormous bouquet of lilies to make the table lovely at home tomorrow. As a final huzzah for our enjoyable trip, here’s a short video by Adam Moskowitz, President of Larkin, proclaiming New York’s finest cheese shops. Some of the shops we visited are on his list. This entry was posted in Uncategorized and tagged affineurs, charcuterie, cheese, cheesemonger, New York City, shops, travel by The Cheese Traveler. Bookmark the permalink. sounds like a really nice trip ! Paul, It was a really great trip: full of great cheese shops, time to connect with other cheesemongers, opportunities to learn about tasty artisan foods, finished off with a tasty meal.